Our environment is also changing, at least in part due to our own impacts. Innovators in green tech are racing against a different kind of clock, one that affects the entire natural world. In 2017 global energy related CO2 emissions reached a record 32.5 gigatonnes, whilst climate related disasters, hurricanes, monsoons, floods and drought, cost a record $250 billion. Building users needs are also changing. Changing in response to emerging social patterns, as a result of changing regulations and in response to wider political and economic pressures. The pressure on professionals to demonstrate and then to maintain their competence during their working life are growing, accentuated by the need to demonstrate an awareness of the social, technological, economic, environmental and political changes around them, and to show that their core professional competence is keeping pace with them. I would not be much use as a lighting professional if I was not up to date with technological tsunami that is the transition to LED lighting, or the environmental pressures that drive energy standards for the lighting sector. The needs of our members – both ASHRAE, and members of my own organisation, CIBSE, and indeed of HVAC&R and similar societies around the world – are also changing. Our engineering societies need to adapt our historic knowledge base to help our members to meet these challenges and to deliver engineering solutions that address the needs of clients and society in a changing world. I’d like to take you back to 1997 to Scots Valley California. Two American software engineers, Reed Hastings and Marc Randolph, set out to change how people enjoy movies at home. They create a membership film rental business that delivers DVDs to their customers door, but in 2011, with changing technology allowing faster internet speeds, they ‘adapt’ their business model to streaming video online. Their innovation is called Netflix. Today Netflix’s has in excess 125 million subscribers worldwide, with annual revenues of over $11.6 billion dollars – rivalling traditional studios with its new content creation and fundamentally changing the way we expect “entertainment” content to be provided. Such technological innovations are rapidly changing the way we live and work now, allowing us to conduct virtual business meetings, switch on the central heating as we drive home, and manage our bank account via our smartphones. These technological advances we are presented with, provide untapped potential, if harnessed in the right way. Change is of course not only due to technological disruptors. As I have already mentioned, we all see and experience negative consequences from our own impact on the environment, and environment we all share. But here’s a question, what happens if a major disruption fails? If Netflix fails, we can go back to the line for a movie ticket, or we turn to another provider. But we cannot hold back the tide of environmental disruption – we can only adapt to it and look to mitigate the future impacts. We cannot switch planets, but we can phase out harmful materials, and look to invest in green energy alternatives. As well as this technological and environmental change, we live in an era of political and economic shifts, with nations re-asserting themselves: China reminding us over the new year of its ambition to be re-unified with Taiwan, and the UK as it approaches Brexit. By 2050, more than half of the world’s population will reside in just 10 countries, and as rural populations relocate to cities, those cities will need to be smart, with transport systems and housing, requiring innovation and the investment to support them. There is economic pressure on the construction sector, too, with the World Economic Forum working group on construction engineering calling for global transformation of our sector. We must continue to adapt and look to mitigate the future impacts - awareness, education, knowledge and innovation being key drivers. And these are all things which our engineering societies need to address. Our Societies, ASHRAE and CIBSE, have over a century each of experience of developing and delivering the guidance and standards that enable the HVAC&R sector to deliver comfortable, healthy indoor environments. We must adapt that knowledge and guidance, updating it to reflect changing weather and climate for example, revising it to consider the needs to be energy efficient and sustainable. And all the while we need to remember that it is no good occupying a comfortable, sustainable and energy efficient space if it not also safe in the here and now, and healthy for the longer term. We have a responsibility as engineering societies to adapt our professional guidance to enable our members to deliver competent, professional, engineering solutions adapted to the need of the 21st century. Our memberships have the power to deliver positive impacts on people’s lives. Everything that we do, can make the built environment better – whether through the products we make, the projects we design, the buildings we manage, operate, maintain and refurbish, the codes and guidance we write or the standards and regulations we contribute to and help to improve. And I am not only talking about the big budget landmark developments but also the everyday projects - the housing schemes and other smaller projects that have a significant local impact, that touch people’s daily lives and make them better. And we know that these are also the projects that contribute to cutting carbon emissions in the built environment, cuts that are essential in our response to our changing climate. 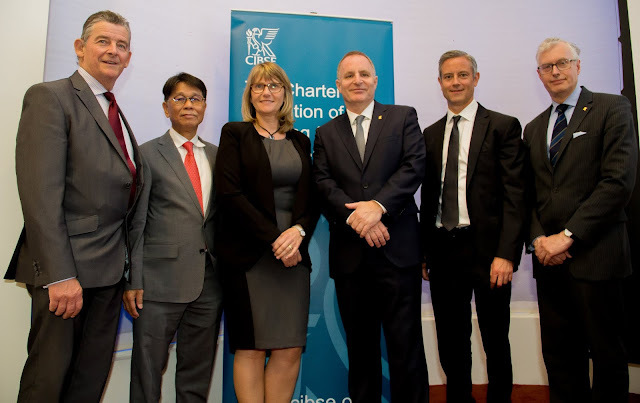 It is clear that construction must change, and as a charitable body that exists for the public benefit CIBSE is committed to being at the forefront of delivering that change. Construction is a large, complex supply chain where disruptive and rapid innovation can be difficult. Pan-industry collaboration provides the opportunity to leverage shared innovation and incremental value across the sector. Not only pan-industry collaboration, but collaboration between like-minded professional organisations. There is an urgent need for the many professional bodies that are represented here at this Winter Meeting to come together, on equitable terms, to help our members to adapt to the changing world in which we live. Have we stopped to ask what the equivalent of Netflix is in our space? How is the internet changing the way that professional engineering knowledge is being created and delivered? How will the millennial generation access reliable and authoritative guidance and standards? Will they come to Winter Meetings or large physical gatherings to help create that guidance? Change is coming, of that I am sure none of us has any doubts. How will we adapt to that change? How will our engineering societies adapt to that change? These are questions that we need to start to answer. I’d like to tell you about one answer I saw in a cartoon recently. A speaker is standing on a stage like this one and asks her audience a question. “Who wants change” – Every hand in the room goes up. She followed that up with “Who wants to change?” – Heads go down loss of eye contact, shuffling of feet. When our speaks asks “Who wants to lead change” – Her audience has left the room. By the fact of you being ‘in the room’ you have demonstrated your commitment to leading positive change, and for that I would like to thank you. I would like to leave you with a famous quote attributed to Stephen Hawking, the brilliant theoretical physicist and cosmologist: ‘Intelligence is the ability to adapt to change’ And adapt to change we must.